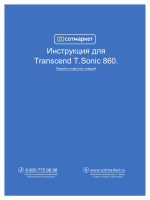 Инструкция для Transcend T.Sonic 860.
voice recorder with the built-in microphone. * Max. music playback time achieved with Screen Saver enabled and “Lyrics Sync” disabled. Desktop or notebook computer with a working USB port. These usage and safety guidelines are IMPORTANT! Please follow them carefully. Unpack the contents of the MP860 package carefully. resets, and in the worst case, permanent damage to the player’s firmware. Do not use a damp/wet cloth to wipe or clean the exterior case. computer, or other storage medium. your computer or motherboard User’s Manual for USB driver information. volume control therefore risking a dangerous noise level for their ears. Your MP3 player is limited to a volume level of 100 decibels. concerning portable music devices (24th July 1998 Order). Never use the “Quick Format” or “Full Format” functions in Windows® to format your MP860. switch is not enabled before turning on the player. the player will gradually drain power from your notebook’s battery. http://www.transcendusa.com and download the latest firmware version for your device. hand corner of the player’s screen. Leave the player plugged in until the battery charging animation stops. monitor or other peripheral. This can permanently damage your digital music player. or use the Transcend USB Power Adapter (optional). It takes a few seconds for the MP860 to power up. button to turn off the MP860. It takes a few seconds for the MP860 to completely power down. button to play a selected music, video, photo, E-book, or recording file. to pause and un-pause a song, recording, or video during playback. to skip to the next available song. to go back to the previous song. button until you reach the desired volume level. The File Navigator is a fast and convenient way of moving between tracks, files and folders. MUSIC, VIDEO, PHOTO, or E-Books modes to open the File Navigator. mode will be shown (except in FILE MANAGEMENT mode, which displays all files). buttons to move up and down the list of files. button to open Options menu. Cancel to return to File Navigator mode without deleting. Please see the “REPEAT” section in the Music mode for detailed instructions. Please see the “A-B REPEAT” section in the Music mode for detailed instructions. pressed while in your pocket. 1. Open the microSD card slot cover with your fingernail. for 3 to 5 seconds. pull it directly out of the slot. For best results and compatibility, we strongly recommend using a Transcend microSD Card. memory card in the MP860 music player. cause accidental deletion of data, product malfunction or damage to the microSD card. advised that the MP860 only supports WMA-DRM10 file protection. to power ON the unit. The Main Menu will appear. button to enter the Main Menu. to begin listening to a music file. 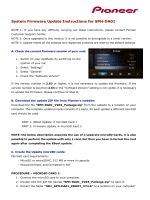 Please see the Specifications section for a list of all music file formats the MP860 supports. If the music player cannot find any compatible files, a “No Files Found” message will be displayed. until you reach the desired volume level. button to open the Options menu. button to mark the beginning of the section you want to repeat. button again to mark the end of the section you want to repeat. 5. The marked section of the song will playback in a continuous loop. button once more to stop the A-B repeat function. Boost, User EQ, SRS WOW, SRS WOWHD, and SRS Custom Mode. difference between each mode through the earphones. to confirm the new EQ setting. This menu contains customizable audio settings:User EQ, SRS Custom Settings, and Fade In / Fade Out. The User EQ allows you to customize a 5-band equalizer to your personal preference. buttons to switch between five bands: 80Hz, 200Hz, 1KHz, 4KHz, and 8KHz. to confirm and return to the “Custom Settings” menu. SRS 3D, TruBass, Focus, Center, Definition, Speaker, and Limiter. buttons to adjust the value. to confirm and return to the “SRS Custom Settings” menu. increase as the next song starts. 4. Select “On” to turn on this function, or “Off ” to turn the function off. to confirm the new playback speed. until you reach the desired level of playback speed. This function displays synchronized lyrics (if available) on the screen during music playback. file must be transferred to the MP860. 3. Select “On” to use Lyrics Sync, or “Off” to turn the function off. This function can be used to mark a specific part of song so you can easily return to it in the future. buttons to select “Add Bookmark”. button to bookmark the current position of the song. 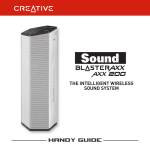 The MP860 includes five built-in playlists that can be used to sort your favorite songs into different groups. Ex: you may choose to add “dance music” to My Playlist 1, and “love songs” to My Playlist 2.
button to add the currently playing song to the highlighted playlist. to return to My Playlist. Cancel to return to the Options menu without deleting. Total Time, Bit Rate, Sample Rate, File Format). to return to the Options menu. microphone and begin voice recording. 2. An automatically generated file name for your recording will appear on the screen. button. A “Stop Recording” message will appear. sound or voice you are recording. To adjust the Record Source, please see the “Settings / Record Source” section of this manual. Please see the “Recording the Radio” section in the RADIO mode for detailed instructions.
. (Earphones must be plugged-in to listen to the Radio). 4. The current FM Radio frequency will be displayed. to auto-scan for the next available station. The MP860 lets you save your 20 favorite radio stations (CH01 to CH20). to select the radio station (FM frequency) that you want to save. the current radio station to that channel. to open the Options menu. automatically scanned and the 20 channels with a strong signal will be saved. The previous 20 channels in station list will be reset first when using this function. buttons to select a channel number. to listen to the selected channel. 3. To un-mute the radio, select “Start Playing” from the Options menu. 1. Select a radio station that you want to record. button for 2 seconds to begin recording the station. and file destination will appear on the screen. while viewing a photo will start the Slideshow function. This option lets you adjust the way files are displayed on the screen when browsing for a specific photo. to view the image at its normal size. This option adjusts the amount of time in between each picture displayed when viewing slideshows. time takes longer than the slideshow interval, the photo will be displayed immediately after it is decoded. This function adjusts the way that each image transitions onto the screen during Slideshow playback. Sets current picture as the music player’s main menu background image. In order to maximize the screen’s resolution, video playback is displayed horizontally. convert them to a compatible format. This function can be used to mark a specific part of a video so you can easily return to it in the future. button to bookmark the current position of the video and continue watching the video. Rate, Total Time, File Size). icon will appear in the top right corner of the screen. The MP860 only supports “.txt” format text files (unicode UTF-8 or UTF-16). This function lets you jump to a certain position of the document. Sets the speed at which pages are automatically turned. This function can be used to mark a specific place within a text file so you can easily return to it in the future. button to bookmark the current page that you are reading. directory of the selected storage device. buttons to highlight your desired destination folder or the Root (default) directory. button to perform the move or copy and return to the previous screen. button to go to the Main Menu. The quality of an audio recording can be set to Low, Medium, or High. require more memory space to save the recorded WAV files. FM Radio and Line In are recorded in Stereo. MIC voice recordings are recorded in Mono. source of the sound or voice you are recording. Recording method used by the MP860. This option allows you to increase the input volume when recording voice or audio. This function lets you enable/disable the screen saver, and set the screen saver’s auto-activation time delay. This function sets a time delay to automatically power OFF the MP860, regardless of playback status. This option lets you adjust the brightness of the screen. function lets you switch between MTP or USB transfer modes. Note: In MTP transfer mode, all files will be stored in the “MTP” folder. Changes the effect displayed during menu interface transitions. look of the MP860 menus. any songs, pictures, or other files you want to save before proceeding. to return to the SETTINGS menu. This option lets you adjust the local date and time. to move between Year, Month, Day,12hr/24hr, Hour, Minute, and AM/PM. to confirm your new time settings. This displays the MP860’s firmware version and available memory capacity. button to return to Main menu. No drivers are required. These Windows® Operating Systems have built-in drivers to support the MP860. letter will appear in the My Computer window. No drivers are required. Plug your MP860 into a USB port and mount it. 1. Create a directory for the MP860. NEVER use Windows to format your MP860. your important documents and other files. connecting to a computer, Please plug the MP860 directly into your computer’s built-in USB port. 2. When connected to a computer a USB connection screen will appear. USB Data Transfer: For transferring files to and from the player’s internal memory. playback functions of the player. No data transfer is possible in this mode. is chosen, the player’s audio and video functions will not be available. buttons to select your desired connection mode. MP860 internal memory) with a newly assigned drive letter will appear in the My Computer window. own folders within the MP860 and copy files directly to the folders. synchronize WMA-DRM10 music files with the MP860. 2. The Safely Remove Hardware pop-up window will appear. Select it to continue. 4. Unplug the MP860 from your computer. 1. Drag and drop the Disk icon that corresponds to your MP860 into the trashcan. 2. Unplug your MP860 from the USB port. 1. Execute umount /mnt /MP860 to un-mount the device. Software to convert them to a compatible format. installed in order to use the MP860 Video Converter software. 1. Put the Software CD into your computer’s CD-ROM drive (Auto-Run enabled). 2. The MP860 Main Menu window will appear. 3. Select “Video Converter” and follow the instructions that follow to install the MP860 Video Converter. Wizard will guide you through the installation process. 5. When the MP860 Video Converter is finished installing, click the “Finish” button to exit the wizard. If you want to play videos on your MP860, you can convert the files using the MP860 Video Converter. ” button and select the video file that you want to convert. ” to select the destination to save the file to. ” button to convert the selected file to .AVI format. 5. When the conversion is complete, copy the newly created .AVI video file to your MP860. service center, or local Transcend branch office. We also have FAQ and Support services on our websites. Go to the Device Manager in the Control Panel and enable the Auto-Insert function for the CD-ROM drive. Alternatively, you can manually run the “MP860.EXE” file on the software CD. Is your MP860 properly connected to the USB port? If not, unplug it and plug it in again. Is the USB port enabled? If not, refer to your computer (or motherboard) user’s manual to enable it. Is the MP860 connected to your computer? If so, unplug it. Is the LOCK switch set to “LOCK”? If yes, set it to the “OFF” position. Is the battery out of power? If yes, please recharge the battery. Are the earphones properly connected to the earphone jack? If not, reconnect them. Is the volume loud enough? If not, increase the volume level until the music can be heard. The default language of the MP860 is English. Please set the player to the appropriate language first. The MP860 music playback screen displays song details based on each file’s ID3 tag information. You can modify the ID3 tags of your music files by using Windows Media Player or Winamp. If no ID3 tag data is available, only the file name will be displayed on the music playback screen. 1. If remaining battery capacity is less than 10%, the player will not enter the record mode. Unplug the earphones and plug them back in again to make sure they are securely connected. http://www.transcendusa.com/ and download a Firmware Update for your MP860. How do I find out what Windows Media Player version I am using? Open your Windows Media Player program. Click on the “Help” menu and select the “About Windows Media Player” option. The version of your Windows Media Player will be displayed on the computer screen. The MP860 only supports WMA-DRM10 music files, is this the file type you are using? with the MP860’s MTP Folder. one of these files types. Lyrics Sync: Why can’t I see the words of the song I am listening to? message does not indicate a problem with the music player. warranty is subject to the conditions and limitations set forth herein. the date of purchase. 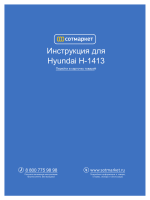 Proof of purchase including the date of purchase is required to collect on the warranty. provide a functional equivalent product, or a refurbished replacement product. illegal or unenforceable under applicable law. *The Transcend logo is a registered trademark of Transcend Information, Inc.
*All logos and marks are trademarks of their respective companies.